Position Responsibilities: The Research Analyst provides support in handling the more complex data requirements of clients by designing and producing report formats/analysis and presentation materials specific to the information needs of clients. The position ensures quality of data/reports/analysis and proper documentation of trends and competitive network performance in terms of TV ratings/loading. He/She is present to help the Section Head in the testing and implementation of process improvement scheme/s, coordination of data flow across sections/clients and training of junior staff in the use of specialized TV audience monitoring software and TV advertising info system. Contact Person: Should you have any clarifications, you may reach GMA Network at 982-7777 local 2595, 2505, 2504, 2516, and 2520. Look for Ms. Maria Rosalina M. Balais-Oregas, Personnel Manager. 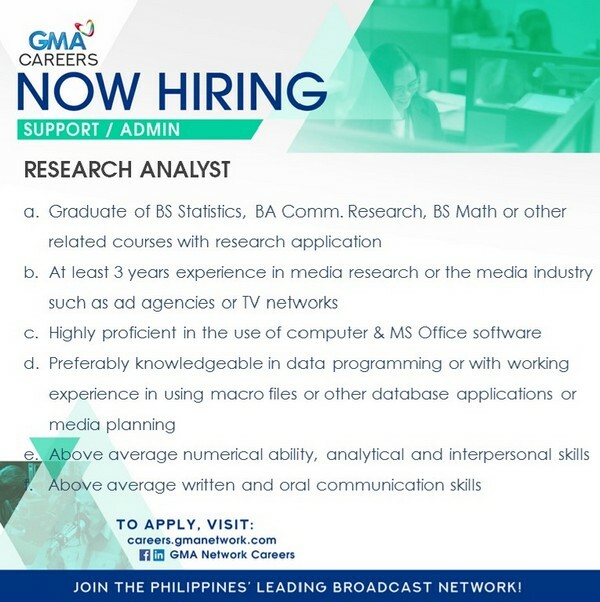 For more information, please visit this link https://careers.gmanetwork.com/JobDescription/431 at the GMA website. ©2016-2019 Philippine Statistical Association, Inc.